The last day of the off-site was uneventful. Again, we started with Continuing Legal Education courses at 8 a.m. Today's topic was negotiation and settlement advocacy. The speaker was very good. Then our general counsel gave a presentation on the state of the legal department. I ate a bite of pizza before I took this pic. Very hungry. Again. 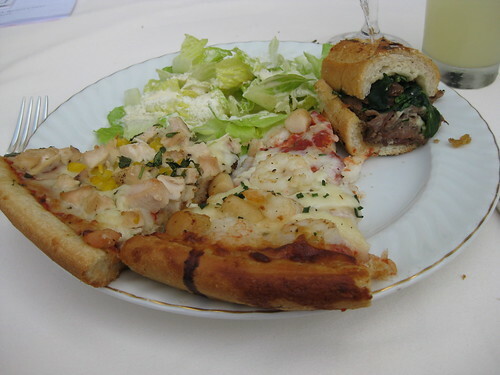 Both the grilled chicken and corn pizza and shrimp and scallop pizza were interesting. The steak, gorgonzola, and spinach mini-sandwich was the best thing on my plate. Dessert was edible today. Not good but not gross. Cannoli and berry tiramisu. Mr. Monkey called and said he scored some $4.50 tickets to a concert tonight. I am dead-tired, but I can't pass up this almost-free concert. Wish me luck in not zonking out. Corn pizza? That's a new one. I love gorgonzola on everything. That sandwich looks yummy. Good Luck! Just try to channel the powers of insomniac. Hmmm that dessert looks good. 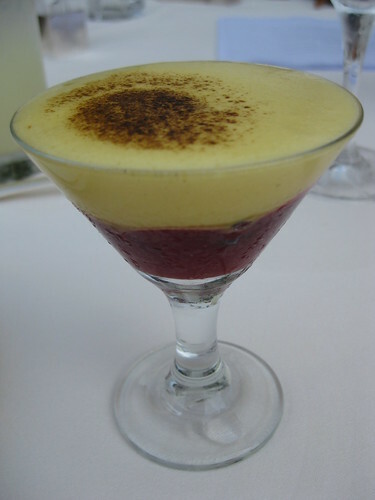 We registered for (and received) martini glasses just for potential dessert serving purposes. that first paragraph killed me. this is why i can't go back to school. my ADD kicked in halfway through just READING about it. i would definitely try that pizza, it looks interesting...and slightly tasty. I can't believe you went out to a concert after all that running around. You're a rock star. 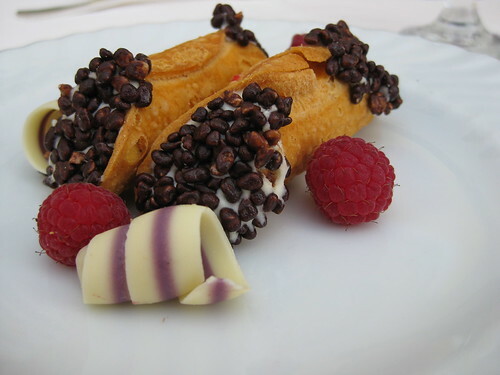 That is the freakiest looking cannoli I've ever seen. But the other thing looks tasty. See? I was so delusional off the food pics that I left a comment on the wrong post. Need.Sleep. Thanks again for sharing all the great pictures! corn. yum. the first time i saw it, it was on a pizza with bulgogi and kimchee in korean. totally bizarre combo.